Roentgenium (pronounced /rɛntˈgɛniəm/, /rʌntˈdʒɛniəm/) is a chemical element. It is a transition metal. Its symbol is Rg, and its position in the periodic table of the elements is 111. 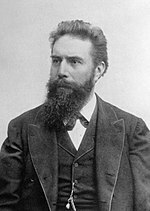 The element is named in honor of a German physicist Wilhelm Röntgen. So far, it has not been found in nature. There seem to be 7 isotopes. All of them are radioactive. They have a half life of between 1.6 milliseconds and 26 seconds. Because of the Inert pair effect, it could have a color similar to that of gold. This page was last changed on 15 January 2019, at 16:56.